Official Alice in wonderland posters. Four new Alice in Wonderland wallpapers have been released online. Featuring March Hare, the White Rabbit, the Dormouse, and the Chesire Cat. I personally love the Chesire Cat. He looks cute. Click on the image to enlarge.. HD Wallpaper and background images in the Alice in Wonderland (2010) club tagged: alice in wonderland wallpapers posters. This Alice in Wonderland (2010) wallpaper contains kitten, kitty, tom, tomcat, cat, and true cat. There might also be egyptian cat, tabby, and tabby cat. U don't think hes cute "Sashlow?!?!" Me & my friends think hes adorable =)) !!! 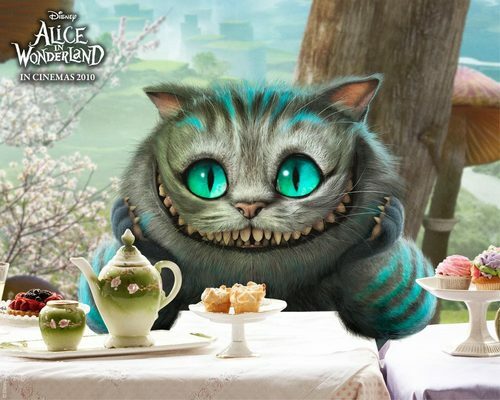 i love the cheshire cat...he looks so cute! Love him.And It made me wonder.